Qaddafi pulls the knife from his back and stabs back. There really is no way to strafe your enemies from the air without killing innocent people and incurring considerable collateral damage, ask any Iraqi, Afghan, or Pakistani who suffers such attacks by the United States on a nearly daily basis. And while the United States and NATO have justified for decades now these grievous tactics, they are suddenly quite sensitive regarding their use in opposition to their hoped toppling of Libya's Qaddafi. Deciphering the events on the ground in Libya is admittedly difficult. But we can be sure of one thing, the globalists want Qaddafi out and his defiance has conjured an almost tangible, rabid fit from the global-corporate elite whose future plans hinge on the domino effect they most assuredly started in Tunisia and Egypt with US-funded CANVAS, International Crisis Group ElBaradei, and the US-trained, funded, and directed April 6 Movement in Egypt. 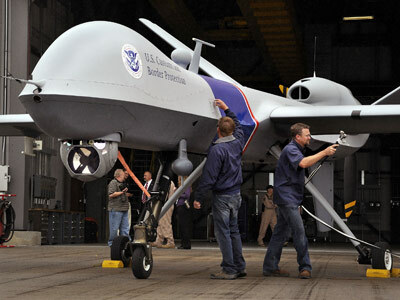 drone, like the ones in Afghanistan, will "start" with reconnaissance. The International Crisis Group, of which Egypt's protest leader Mohamed ElBaradei sits as a trustee beside Zbigniew Brzezinski, George Soros (the "Funding Father" of Egypt's new constitution), notorious neo-con Richard Armitage, and NATO's Wesley Clarke, has made a statement calling on the United Nations Security Council (UNSC) to implement a no-fly zone over Libyan airspace. This is meant to prevent Qaddafi from using his air force to strike back against the growing insurgency. These are not signboard carrying, fist waving protesters. By both Libya's and the corporate owned media's admissions, the protesters have seized armored vehicles and military weapons and are advancing on military bases to seize yet more. It is an armed insurrection by all accounts. China is reporting that a thousand of their workers have been routed from the country by looters, and reports of arson, wide spread violence, and disorder also indicate the protests are not peaceful. It should be noted that the West is fully prepared to foment such unrest in foreign nations. The US Brookings Institute report "Which Path to Persia?" specifically suggests supporting hordes of protesters as in the Iranian "Green Revolution," funding, equipping, and supporting known terrorist groups, and proposing the use of US military support, covert and otherwise support both protesters and terrorist groups. There is no reason yet to discount the possibility of such support being lent to Libya's uprising. Indeed, in Iran, the US is already overtly supporting the "Green Revolution," the funding of subversive political activities, and operating terrorist organizations within the country. The elated bravado found splashed across the pages of globalist think-tanks, gloating over the successes in Tunisia, Egypt, and the gleeful celebrations as it spread out has now been replaced with almost child-like fits of hand-wringing and over-the-top propagandizing over reports admittedly coming from hearsay amongst the Libyan protesters themselves. The best example is Brookings Institute Senior Fellow Daniel Byman's hand-wringing found in his article, "Democratization From Above? In Libya? Unlikely." "Muammar el-Qaddafi’s regime in Libya, we can hope, will be the next government to fall as the wave of protests and calls for better governance sweep the Middle East," says globalist policy wonk, 9/11 Commission white-wash staff Daniel Byman. He most likely means better "global" governance via US-funded "civil society." He goes on with a litany of childish interjections, devoid of facts the mainstream media and foreign governments concede are difficult to obtain or confirm. Eliot Abrams (CFR, PNAC) makes his desires to see Qaddafi removed from power abundantly clear in a National Review piece posted on the Council on Foreign Relations' website, titled "Ghadaffi's End." The Council on Foreign Relations has their entire front page covered in topics relating to the unfolding crisis in Libya. The Foreign Policy article "Intervening in the Libyan tragedy," calls again for NATO and the UNSC to intervene, including enforcing no-fly zones, holding military officers responsible for defending the embattled regime, and "sending a strong message" to other regional autocrats who might be tempted to fight back against the Western-backed conflagration consuming North Africa and the Middle East. The mainstream media is already falling over itself to make a case for military intervention, in op-eds like this one from the Christian Science Monitor, perhaps due to globalist fears Qaddafi may yet battle his way out, emboldening other targets of globalist ambition to strike back against Western-fomented unrest inside their countries. Cuba's Fidel Castro, long standing in the way of globalist ambition, stated recently NATO may use the unrest as pretext to invade Libya. Perhaps Castro's been reading the globalist think-tank reports as well. Another tell-tale sign the globalist's are ruffled over Qaddafi's defiance is simply looking at BBC's one-sided coverage. In a recent report, BBC once again concedes that reports coming out of Libya are "impossible to report." Despite this admission buried within their article, they continue relaying reports coming out of the US State Department's Movements.org's translations of protester accounts. Movements.org's efforts can be observed by following them on Twitter via @AYM, revealing nearly everything reported by the mainstream media is coming from the US-backed "Twitterati." BBC's Frank Gardner says this of Qaddafi's defiance: "
"Even by his own bizarre and eccentric standards, the latest speech by Col Gaddafi was breathtaking in its defiance of both the wider world and the reality now facing him. Speaking from his favourite location, Tripoli's bombed-out Bab Al-Azizia Barracks, he referred to the protesters variously as "cockroaches" and "traitors" who were "drug-fuelled, drunken and duped". At times, the Libyan leader seemed to lose control of his temper, shouting his words in Arabic. At others, he paused to adjust his matching khaki shawl and cap. His language, while undoubtedly aimed at shoring up what support he still has in the country, was one of quaint nationalist slogans from the 1960s and 70s. To many of those opposing his rule, who use Twitter, Facebook and the internet, this was a speech from a bygone era from a man whose time they believe has long passed." It is safe to say objectivity has long since been abandoned by BBC. We hear again from BBC's Jon Leyne who claims eastern Libya appears to be wholly under opposition control and that people are "deliriously happy." It appears BBC has no problem accepting the charged rhetoric of their Western-backed "Twitterati" as fit to print, and are determined to once again convict Libya in the court of skewed world opinion. What many may be wondering now is when the International Crisis Group will likewise call for no-fly zones over Central Asia to stop a similar atrocity, now 10 years in the making, from continuing on, or perhaps why the Western public's outrage over Libya isn't equally matched with anti-war sentiment against the United States and the UK. And one may wonder if Qaddafi wore a Nobel Peace Prize and used drones instead to strafe his opponents, if then his bid for power would be acceptable to world opinion. 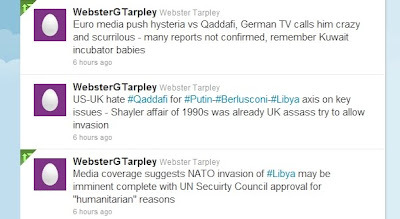 Respected geopolitical analyst and historian, Dr. Webster Tarpley leaves us with a cogent reminder and warning to remain objective and skeptical in regards to the media circus. He cites specifically the hyped-propaganda used to start the first Gulf War regarding the "Kuwait incubator babies." Dr. Webster Tarpley warns of hyped media coverage. Dr.
Tarpley can be followed on Twitter via @WebsterGTarpley. And this is the overall point, not to defend Qaddafi or the use of military aircraft certain to incur innocent deaths, but to point out how the global elite are creating and then manipulating the unrest. The point is to show how the global elite are forcing regimes to pick between global hegemony ruled by the depraved plutocrats of Washington and London, or paying a heavy price to remain sovereign and sort out national problems in their own way.